Wooden Train Whistle crafted from natural pine. Made in USA. Size 5-1/2 inches long, 1-3/8 wide and 3/4 thick. 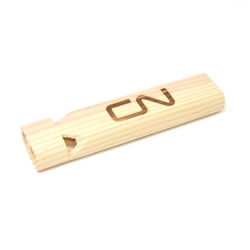 Branded with the CN logo.